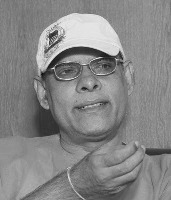 LTTE’s one time global arms procurer and financial controller Pathmanathan alias KP, accusing the Tamil National Alliance (TNA) of misleading Tamil youth in this country by spreading false propaganda, expressed regret at Tamil politicians’ failure to live up to the expectations after government had restored peace in the once war-torn areas. In an exclusive interview with The Nation, Pathmanathan declined to describe his current position though he is being held by security authorities. He did not clarify whether he is a terrorist suspect, a political prisoner or a partner in Sri Lanka’s development process. He was full of praise to Defence Secretary Gotabhaya Rajapaksa for creating a noble concept by getting his expertise to help the people in the once war-affected areas. Pathmanathan who looked relaxed and quite happier, answered the following questions with confidence. You are breaking silence after a long interval. What is your status? Do you stand as a terrorist suspect, political prisoner or partner in Sri Lanka’s development process? Could you please clarify who and what you are now? My movements and activities are restricted. I am in a restricted area and I have restricted freedom. But, I am using whatever freedom I have to help the people. It was the Defence Secretary who gave me the chance to use my experiences to help the people rather than keeping me as a prisoner in which status I am of no use to the people. I am now able to use all my experiences and knowledge to help my people. I would not have been able to do anything if I were a prisoner. This kind of a scenario would have created a sensation abroad. It is not so because this happened in Sri Lanka. This is actually a noble example. A section of the Tamil people may think that I am working with the government. Some might think that I betrayed the struggle for Tamil cause by supporting the government. They might question as to how I got the opportunity to do this. But as I said, it was a noble gesture by the Defence Secretary to use my expertise to help the people affected by the war. Some say you are a political prisoner. Are there any political prisoners like you held in custody? I cannot respond to that question. Because, I never expected that I would be in a position like this at the time I was arrested. I never thought that I would be given this kind of opportunity to serve my people. This is a new era where an opportunity has arisen for all people to live in harmony. Many who were arrested under the Prevention of Terrorism Act (PTA) are detained while you are given freedom to some extent. What do you have to say? There are thousands of combatants who are detained. I have continuously requested the government and the authorities to expedite the process to release them. The government is focused on rehabilitating them. The government wants to ensure that it successfully completes this process. Thousands of combatants were arrested at the end of the war and were rehabilitated. Majority of them have been reintegrated to the society. When it comes to releasing them, there are certain things that are obstacles, preventing the government from releasing them. Adverse propaganda by certain Tamil politicians and extremist elements of the Diaspora has also resulted in the delay of their release. There were incidents that create doubt within the government about the future of the former combatants once they are released. There was an incident in Trincomalee recently, where a person was killed by the Vinayagam group of the LTTE. In another instance, the constitution of Sri Lanka was burnt by a group of students in Jaffna. Such little disturbances only delay the process. If you look at Tamil politicians, the TNA is trying to mislead the youth with false propaganda. The former combatants get affected by such acts. We have released some of them after lengthy discussions with the government, and we continue negotiations to release the remaining members. The government needs to have a certain amount of faith. Even though the government is prepared to release all 3000, it is not in a position to do due to the prevalent conditions. Everyone, including Tamil politicians, has the responsibility to create an environment where everyone can live in harmony. The government will only lose confidence if these politicians continue stirring the youth, calling them for protests and Satyagraha creating unrest. The government is concerned about the future of the ex-combatants. It is very particular that they are not misled by these elements once they are released. There is no doubt that they should be released. I like to know about your lifestyle now. While being confined to a particular place, are you free to travel around the country? I am a simple human being. I have fine- tuned myself to live in any circumstance under any condition. I am in a small room and doing whatever I can do for the people. Sometimes, I spend a couple of weeks in a small room in Colombo. I have been provided with security. I have been provided with basic facilities such as telephone and internet. If anyone from abroad or Sri Lanka wants to meet me, I meet them with the permission of the authorities. At the same time, I also go to the Wanni to oversee my projects. I run two orphanages and vocational training centers. I go there quite often and spend at least two weeks assessing the progress, and talking to the children and other beneficiaries. I have been given freedom to do those activities. I am a simple man leading a simple life. Some politicians allege that I live a luxurious life. There is no truth in that allegation. You were interrogated by law enforcement authorities. Yet, you have not been tried before a court. Where do you stand in such circumstance? They spoke to me continuously during the first six months of my arrest. They did not interrogate me or abuse me because of my physical condition. I am a heart patient. They questioned me on issues that they needed clarifications. After this process, I was given permission by the Defence Secretary to assist the war-affected people in whatever way I could. The only thing that I asked the Defence Secretary was not to put me in a prison and let my knowledge and experiences go in vain and unused. Have you asked the authorities to try you in court if there is evidence against you? The government has to decide about that. My preference is to assist the people. In that scenario, it appears that you are now a friend of the government? I would not say a friend. I would say that good understanding has been built between the government and me. Do you still have links with the LTTE international network? I have links with many former LTTE people. They have come to understand the ground reality and have come forward to help the people. They come down to Sri Lanka quite often and assist my welfare programs in the Wanni. Do you think that the remnants of the LTTE could regroup to react in the future in a fierce manner like in the days of Velupillai Prabhakaran? Those are speculations that are part of propaganda by certain groups within the Tamil Diaspora. They have selfish intentions. Those who lead these groups would not have fled the country if they had really cared for the people. I am not talking about the normal people. I am talking about people like Vinayagam and Nediyavan who fled the country during several stages of the war, and who now act as agents of the LTTE. They lead a luxurious life abroad and are misleading the youth and people of this country and abroad. The people in the third generation who live abroad do not know the ground reality here. They are clueless of what is happening. Their minds are continuously poisoned against Sri Lanka. Sri Lanka has been portrayed as a country where none can live. But, are there chances of these remnants to regroup? No. Not at all. The maximum they can do is to get hold of youngsters and use them to create small disturbances. But those will be isolated incidents. They cannot regroup as a military outfit. The military and the police are also vigilant and are very effective in controlling such situations. You were one who fully supported a separate state in this country. Now, the LTTE is no more. Do you still advocate or support a separate state in this country? Firstly, Tamil Eelam is a lost dream. Secondly, we cannot achieve something that is not backed by the international community. We should understand the reality. I would support a solution that is accepted by all people. You amassed a huge wealth during the days with the LTTE, handling all financial affairs including shipping matters. Where is that wealth? What has happened to it now? When I left the organization in 2003, I handed over everything including my wealth and ships to whom that the LTTE leadership told me to handover to. I do not know what happened between 2003 and 2009. I did not possess any wealth at the time, I was arrested in 2009. Pirapaharan (Prabhakaran) used to send me around 1000 dollars for my monthly expenses while he was alive. That was all I got. I might have had around 1000 Ringits when I was taken into custody. I have no wealth as claimed by certain people. There is an image created that I possess enormous wealth because I was in charge of key operations of the LTTE’s international network. It is a wrong perception. When I launched welfare programs among the people, the general perception was that I have enormous wealth. Actually, I am being assisted by friends and well-wishers from several countries for the smooth operations of the welfare activities. What are your plans? Will you be spending the balance period of your life confined to the place which you now feel safe and comfortable because you face threats from the LTTE remnants here and abroad? This is not in my hands. It has to be decided by those who are supposed to decide. My focus is to assist the people. I feel I could do a better job if I were given more freedom. But it is in the hands of the authorities. But do you feel you could be threatened by LTTE remnants? « Is Sri Lanka heading towards another July ’83 with Muslims as the Target?